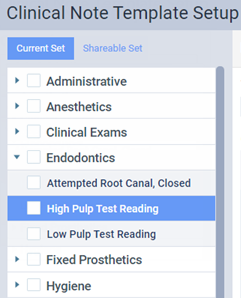 For any location, you can customize the default clinical note templates that are included with Dentrix Ascend and any of your custom clinical note templates. Tip: Even though a clinical note template is associated with a location, if someone makes that template a favorite, that person will have access to it from all locations because favorites are associated with user accounts. Change the name and/or category of the template, and then change the note text and quick-picks (prompts) as needed. Template name - Type a name for the template. Category - Select one of the pre-defined categories for this template. Clinical note text - Type the text of the note, and insert quick-picks as needed. 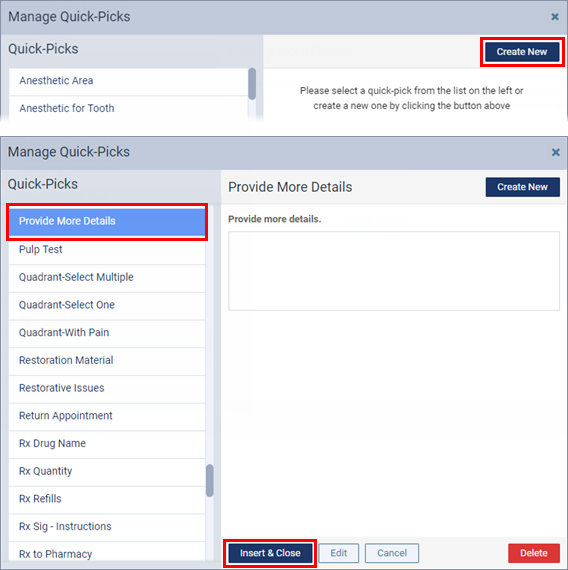 Quick-picks: A quick-pick allows you to create a clinical note from a template dynamically. When you use a template that has quick-picks to add a clinical note, Dentrix Ascend will show messages that prompt you to enter responses to the specified questions. In the Insert Quick-Pick search box, begin typing to search for one of the pre-defined quick-pick, continue typing as needed to narrow results list, and then select the desired quick-pick. Use the Ctrl + , (comma) key combination to make a search box appear, begin typing to search for one of the pre-defined quick-picks, continue typing as needed to narrow results list, and then either click (or tap) the desired quick-pick or use the down arrow key to select the desired quick-pick and then press Enter. To browse for a quick-pick and then insert it, click (or tap) Manage Quick-Picks, select one of the Quick-Picks, and then click (or tap) Insert & Close. 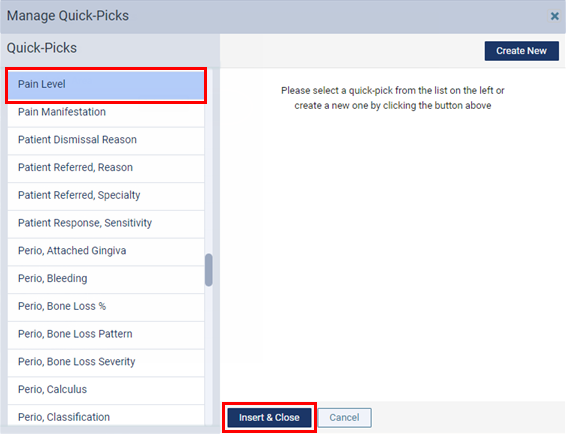 To create a new quick-pick and then insert it, click (or tap) Manage Quick-Picks, click (or tap) Create New, complete the steps to create the quick-pick, and then, with that newly created quick-pick selected, click (or tap) Insert & Close. Removing - To remove a quick-pick from the note text, click (or tap) that quick-pick's Remove button.